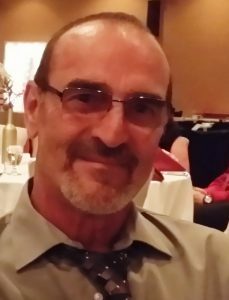 Funeral Service Monday, May 7, 2018 11:00 A.M.
David was born April 12, 1960, in West Point, Nebraska to Joseph and Martha (Tomasek) Pycha. He attended Clarkson schools and graduated from Clarkson High School in 1978. On September 29, 1984, he married Annette Novak in Schuyler. They had two sons and later divorced. Over the years, David worked for Husker Coop, the City of Columbus, had owned and operated D and A Transfer in Columbus, and later worked at Bomgaars, Arkfelds in Norfolk and Menards in Columbus. David is survived by his two sons; Joshua (Brieana) Pycha of Kearney, Benjamin and fiance Maria Tuma of Schuyler, his mother, Martha Pycha of Schuyler, three sisters; Janice Pycha and her husband Steven Guthrie of Lock Haven, Pennsylvania, Julie (John ) Cech of Schuyler and Joyce (Jeremy) Dauel of Lincoln, his ex-wife, Annette Pycha of Schuyler and two nephews, Joe Cech of Omaha and Matthew Dauel of Lincoln. He was preceded in death by his father, Joseph Pycha and a nephew, Zachary Cech.